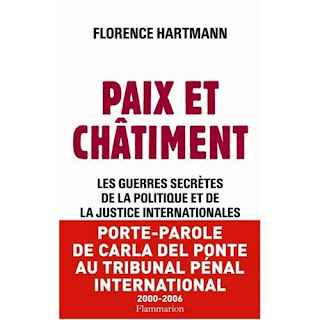 INTRO: Florence Hartmann’s book Paix et Châtiment (Peace and Punishment) has caused strong reactions in international diplomatic circles. Her charges, supported by evidence, that France, Great Britain and the United States have in effect protected Radovan Karadzic and Ratko Mladic, and are refusing to make available documents showing Milosevic’s involvement in the genocide at Srebrenica, have been denied, but without convincing counter-evidence. Florence Hartmann talks to Sarajevo weekly Start about the involvement of the great powers, the reactions in the region, and Carla Ponte’s own position. The author of Peace and Punishment, Florence Hartmann, has accused the great powers, and in particular France, Great Britain and the United States, with obstruction of the work of the Hague tribunal in the trials of war criminals indicted for committing war crimes in the area of former Yugoslavia. They interfered most in the indictment of Slobodan Milosevic, and in the arrest of Radovan Karadzic and Ratko Mladic. Unlike various earlier superficial assertions based on conspiracy theories, Hartmann has relied on facts and evidence to support her argument about the obstruction of the great powers. Reactions in the main have been as expected. The representatives of the international community in Bosnia-Herzegovina have done their best to deny it all. But the facts are on Hartmann’s side: 4,300 days since the call for their arrest, Karadzic and Mladic remain at large. Start: The part which has most caused public attention has been the assertion in your book Crime and Punishment that the great powers have been protecting Karadzic and Mladic. Is this indeed the most important part of your book, and what other information do you think is important in this context? Hartmann: The subtitle of the book, which will be published in the Bosnian language this autumn, is Secret Wars of International Politics and Justice. The book deals with the permanent struggle waged by the Hague tribunal to be allowed to do its work. The court faced not just the obstruction of local governments in the region, but also that of supposed allies, especially France, Great Britain and the United States. The book deals with various instances when the great powers did little to align their political interests with the interests of international justice, which they defended verbally but not always genuinely. Such obstruction on the part of the great powers has prevented The Hague tribunal from doing its work, i.e. fulfilling part of its mandate. I address this in detail, and with a precise description of events which took place far from public scrutiny, mainly behind closed doors. One such example was the non-arrest of Radovan Karadzic and Ratko Mladic. However, this takes up only one chapter, i.e. some 70 pages out of a total of 230. Start: But this is what most interests people in Bosnia-Herzegovina and the region. Hartmann: True, this part of the book is important for public opinion in Bosnia-Herzegovina. But it is not the only part that it will interest it when the book gets published this autumn. For example, one chapter deals with the background of Milosevic’s trial, which is actually a good and illustrative example of the various forms of obstruction coming mainly, of course, from Belgrade, but also from France, Great Britain and the United States. They did not allow access to information in their possession, even though this included evidence of Milosevic’s involvement in the Srebrenica events. They knew that the tribunal had sufficient evidence to win the case against Milosevic, but they did not want to help with additional evidence, for example that which came from intelligence sources. They feared that the public might conclude that the great powers had known what might happen, yet did nothing that could have protected the Safe Area of Srebrenica and its inhabitants. But this adds up to only two out of five chapters. Start: RS (Bosnian Serb entity) spokesmen have used the findings in your book to shift the responsibility for the non-arrest of RS politicians indicted for war crimes onto the international community. What would be your response to them? Hartmann: Clearly, you have not read my book! The RS authorities refused to arrest individuals indicted for war crimes, so NATO took upon itself to do it, and delivered thirty of those indicted, who up to that the time had lived unhindered in that entity. Tolimir was the only one arrested by RS - in circumstances, however, which are well known. Start: Who bears the greater responsibility for the non-arrest of Karadzic and Mladic, the international community or RS? Hartmann: So far as Karadzic and Mladic are concerned, they are both responsible: RS and indeed Serbia, on the one hand, and the great powers on the other. The prosecution constantly pressurised the great powers to deliver Karadzic and Mladic. The fact is that the great powers would never do so on their own. But this does not change the fact that the politicians from RS and also Serbia are in default of their international obligations, not only towards The Hague but also towards the convention on genocide which they have signed. Start: What in your view are the reasons why the great powers protected Karadzic and Mladic? Do you believe in the notorious alleged deal between Karadzic and Holbrooke? Hartmann: There is no firm evidence that there was an agreement between Holbrooke and Karadzic, or between Chirac and Mladic. The great powers deny it, while the supporters of Karadzic and Mladic have not come up with convincing evidence. If there is firm evidence, it would be logical that this would not be made public, because it is Karadzic’s and Mladic’s life insurance. I am not convinced, however, even if such agreements were reached, that they remain valid. Something else, something far more important than promises given to the two people responsible for the most horrific crimes in Bosnia, must have made the great powers unwilling to arrest Karadzic and Mladic during the past twelve years. In my book I give a number of well-founded instances during the past twelve years which show that France, Great Britain and the United States, which played the main role in this, simply did not wish Karadzic and Mladic to be brought to trial in The Hague. Start: What is your evidence? Hartmann: I quote a number of instances which, taken together, show that they obstructed their arrest, while simultaneously pursuing the arrests of other indictees. The denials which I hear these days do not help the public, which has not read my book since it is written in French and which has no insight into the evidence. Only a change in the policy of denial practised up to now would refute the assertion that such a policy is being pursued to this day. After all, we shall soon see whether the EU will do the same as NATO did last November - i.e. give up on Mladic’s arrest, and allow Serbia to sign a Stability and Association Agreement. Start: But what are the deeper reasons why the two were not arrested? Hartmann: I will briefly state what I have explained in my book at greater length: the reasons for the non-arrest of Karadzic and Mladic are to be found in the decisions of 1995. At that time, the great powers decided to sacrifice Srebrenica and Zepa for the sake of peace, and in so doing they created the conditions which led to a massacre that the International Criminal Tribunal for the former Yugoslavia and the International Court of Justice have both termed genocide. It is clear to everyone, here and in the world at large, that it is terrible and unacceptable that the great powers should be doing all they can to hide this. Holbrooke himself said on Bosnian television in November 2005 that ten years before he had been instructed by his government to sacrifice Srebrenice and the other eastern enclaves for peace. He subsequently denied his own statement, even though it exists on tape. It is also a fact that the earlier peace plan, which the French and German foreign ministers Alain Juppé and Klaus Kinkel had proposed at the end of 1994, had envisaged Srebrenica, Zepa and Gorazde being retained as part of the Federation of Bosnia-Herzegovina. But Milosevic would not have this. And in the spring of 1995, while negotiating the terms of the new plan that would be unveiled in Dayton, he planned to attack Srebrenica and Zepa with his army and its subsidiary in Bosnia , under the command of the Army of Yugoslavia and General Mladic. The great powers did not prevent this, claiming that Mladic’s men - in fact the united Serbian and Bosnian Serb police and military forces - had no intention of taking the enclaves. After the fall of Srebrenica, the great powers took no adequate measures to protect the population of Srebrenica, although everyone knew that these people were in grave danger. At that time Mladic was being investigated by The Hague for crimes committed during the previous three years. He stated on several occasions that he would revenge himself on the enclave, because he had failed to take it in 1993. In other words, the crimes were foreseen. After all, General Phillipe Morillon and other international witnesses confirmed this in their testimonies given to the court in The Hague. The same is true of General Wesley Clark, who stated that Milosevic knew in advance that there would be a massacre. Soon after the event, the great powers took measures to prevent a similar massacre in Zepa. In November 1995, when everyone knew of the terrible fate that had befallen the men of Srebrenica, Srebrenica and Zepa were handed over to Milosevic, although the great powers knew of his involvement in the killings. This is why France, Great Britain and the United States were unwilling to have the tribunal establish a link between Milosevic and the massacre in Srebrenica. Start: But why don’t the great powers wish to have Karadzic and Mladic arrested? Hartmann: Unlike Milosevic, who denied any involvement in Srebrenica in line with the great powers’ official story, Karadzic and Mladic cannot seriously mount such a defence. This is why it is believed that, faced with the court of justice, they would put all the blame on the Western states. They would try to show that - whether directly or ‘passively’ - they had a green light to occupy Srebrenica and Zepa. This green light did not, of course, assume a massacre or any other crime. But the forces of Mladic and Milosevic used the opportunity to unleash a genocide. The West did not or could not prevent that. They did not even punish them, because at Dayton they did not force Milosevic to give up Stebrenica and Zepa, just as they have not to this day brought Karadzic and Mladic to The Hague. Start: You accuse some of the most powerful states of protecting Karadzic and Mladic. Is there any relevant or powerful state in the world that would wish to see them arrested, or that at least would not obstruct their arrest? Hartmann: The relations are such that France, Great Britain and the United States decide. This will continue as long as these three powerful states do not change their current policy. They must understand that it is more important for the future of the region, and indeed for themselves, to bring Karadzic and Mladic to justice than to hide their past errors, however terrible these may be. Until that happens, Karadzic and Mladic will not appear in The Hague. Start: The representatives of the international community in Bosnia-Herzegovina, as well as some other international politicians, deny your findings. Do you have evidence to support your arguments? Hartmann: The evidence is largely to be found in the book, which is why they have not come forward to deny them in France, Belgium or Switzerland, where the book has been read. Start: Why have you waited so long to publish your findings? Hartmann: Following my departure from The Hague, I found that I had enough data to be able to analyse the attitude of the Western powers towards justice during the first fifteen years of the existence of the Tribunal, the first international criminal court since Nuremberg and Tokyo, in a manner that would be comprehensible to a wider public, and not just to Balkan specialists. It seemed important to me that the international public opinion that cares for international justice should learn what works and what does not - what are the problems faced by the tribunal. I hope that this will encourage others to help find solutions. I should say that I started to write my book after my return to France, in fact once I realised that I had sufficient evidence to deal with the most contentious aspects of the subject, so that the expected denials would not be credible. Start: What has been Carla del Ponte’s reaction to your book? What have been the responses to it thus far? Hartmann: She has not rejected it. But so long as she serves as chief prosecutor, she would not be in a position to state her view. As for the responses, those that have reached me have all been highly positive, because the book is properly founded, helps people to understand, and does not discourage those who believe in justice, even though I have shown how hard things have been up to now. The common reaction is that it is a courageous book. There are bound to be negative reactions too, but I expect these to come largely from those who have been obstructing the work of the Tribunal and who do not wish that to be known.